The PBC on FS1 returns in 2018 with a full-slate of bouts live on FS1 and Fox Deportes from Minneapolis, Minnesota, at the refurbished Armory. 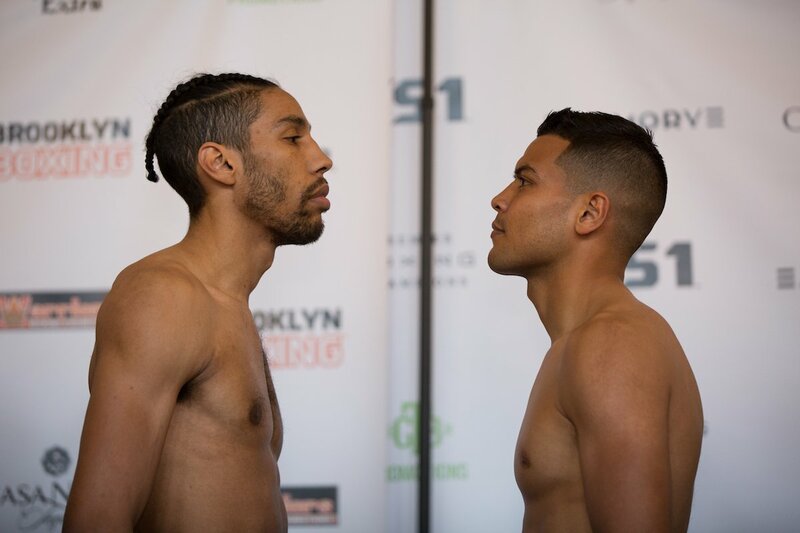 James vs. Ramos, Galarza vs. Cherry, and Dulay vs. Colbert (photo: Brian Schroeder / Premier Boxing Champions) standout as interesting fights that could go either way, the coverage on FS1 begins at 9 pm ET/6 pm PT and includes a whopping 5 bouts in total. Since the fall of 2015, the PBC on FS1 has been the most consistent outlet for competitive prospects and middle-level contenders in the PBC-sphere as far as basic cable. The last Premier Boxing Champions card on FS1 that took place in Minnesota produced a knockout of the year by Murat Gassiev. Minneapolis native Jamal James looks to add to his resume and build off a quality knockout victory over Diego Chaves last December. James’s opponent Abel Ramos shouldn’t be taken lightly, both of his losses our deceiving, coming against high-level opposition in Regis Prograis and Ivan Baranchyk. Ramos brings an entertaining style to the ring and will target the body in effort to slow James. Jamal needs to take his time and be patient on the outside to contain Ramos’s pressure. Although, James has a sizable height advantage, surprisingly there’s only a one-inch reach difference. Jamal’s jab will be a key to control distance and help set up his power punches. At times in the past James lunges with his right hand, something he must correct on Friday night. Jamal’s only defeat came in 2016 to Yourdenis Ugas, who used that win to climb the welterweight ladder. If James is victorious on Friday it could catapult him in to a major opportunity at the deep and ultra-talented welterweight division. Maybe even a summer fight with Keith Thurman who is recovering from yet another injury but will be in need of a dancing partner. The co-feature pits hardened veteran Edner Cherry against a still developing Dennis Galarza at the lightweight division. Cherry has been around the globe in search of top competition and to this day refuses to be labeled a journeyman. Galarza better be in peak form to deal with a stern test in Cherry. If the action inside the ring is even half as good as the pre-fight, weigh-in banter, Austin Dulay versus Chris Colbert could steal the show. The two-unbeaten 130-pounders were very talkative after weighing in early Thursday evening so keep an eye on this one once the bell rings. Another intriguing matchup has a local flavor, when Minnesota’s own Veshawn Owens meets Sebastian Fundora in an 8-rounder at junior middleweight. Owens has plenty power having tallied a knock out in all nine of his bouts. Fundora is a freak of nature measuring in at 6’6 with long limbs in general. Can Owens get inside to land his Sunday punch, or will Fundora’s length and technique be too much to handle? In the televised opener, former No.1 ranked amateur and 9-time national champion, Joey Spencer makes his television debut at the tender age of 18. Spencer is 1-0 as a professional, at the weigh-in he made it clear about the message he wants to send to the viewing audience. Joey faces Ousmane Sylla from Arkansas. Rounding out the card from a Minnesota point of view will be Marlin Sims, Celso Ramirez, Uriel Lara, and Giezwa Pierre Hobbs, all appearing in separate bouts.